Walking into the Avon Loop Community Cottage feels similar to walking into your own home. It’s a welcoming place, with objects and notices hanging on the walls speaking to its history and the role it serves within the Avon Loop neighbourhood as somewhere for people to gather and share space. There’s always shared kai sitting on the table. Couches and chairs are draped with the colourful and textural tīvaevae. I saw Nina engrossed and encased in her work. She was sitting on one of the chairs with a bright blue and orange tīvaevae draped across her knees, looking down at her embroidery hoop, and pulling the needle and thread through the material as she moved in and out of conversations with others. From conversations and text, I learnt that tīvaevae are textiles commonly associated with eastern Polynesia, namely the Cook Islands and Tahiti, but extend into the diaspora. They are often given as gifts or are used ceremonially. They indicate respect and care through the labour and time dedicated to making them. The designs are not prescriptive, but generally reference geometric or natural motifs which allow the maker to be flexible and experimental with the specific design, whilst continuing to work within an established craft tradition. These designs are cut out of brightly-coloured cotton, appliqued or basted onto a larger piece of fabric and further fastened using decorative embroidery stitches. 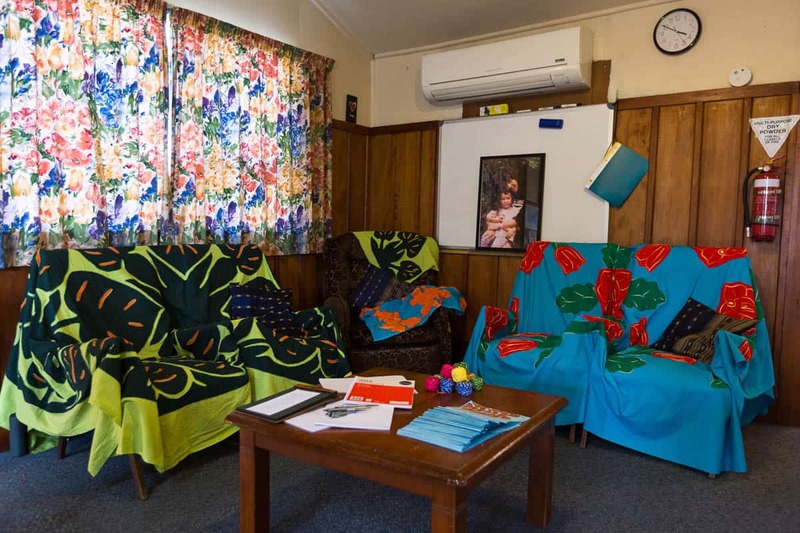 Depending on the type of tīvaevae being produced, some designs are simple two-colour applique (tīvaevae manu, tīvaevae tataura among others), while some are constructed using multi-coloured fabric squares stitched together onto a backing material (tīvaevae ta’orei). In watching Nina work on her tīvaevae, I was reminded of my own experience of learning to hand-stitch. I remember studying my mother’s hand movements as she sat on the couch; I attempted to track and memorise her rhythm before feeling confident enough to pick up a needle myself. I later learned that my grandmother was a professional seamstress and, by my mum’s own admission, would have made a much better teacher. But, with practice, I found my own rhythm and began making my own projects, all the time referencing my mother’s stitches. As someone who lies outside of Cook Island culture, my understanding of the tīvaevae and its cultural significance can only ever be partial, but I am interested in exploring the points at which this object, and the set of practices associated with it, intersect with my own history as a Macedonian immigrant to Aotearoa New Zealand. My experience and memories of this exhibition centred around the sense of community created by the people who shared the space. The cottage was open every Wednesday evening where people were welcome to have a cup of tea, some kai and spend time with friends, family, and better get to know the locals who live in the area. 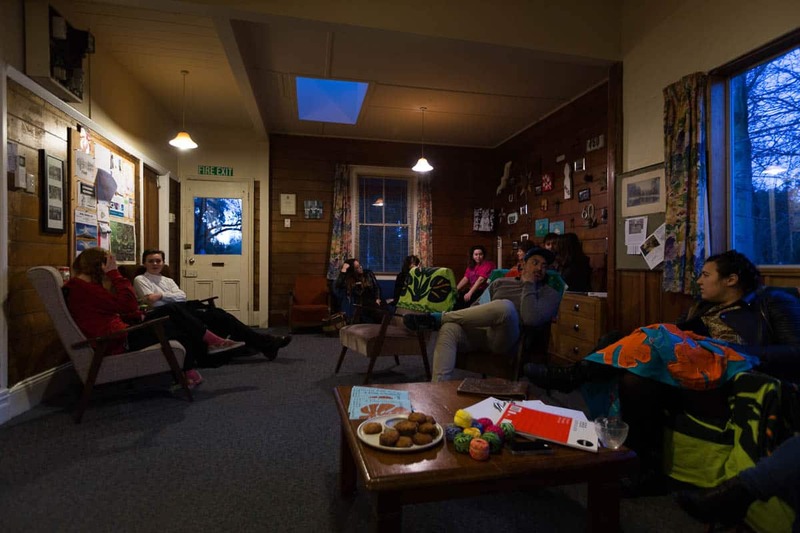 With Nina making her tīvaevae during the open nights, and Stephanie’s writing sitting leather bound on the table for anyone to read, the process of crafting objects and words reconfigured the space to accommodate their personal stories. These stories too, are not heard in isolation. New perspectives are welcomed into the narrative, and generated by the discursive, social and participatory nature of the project. Anyone could share in the process of making, both as a participant and viewer, as there was a spare hoop and fabric for people to practice their hand stitching or learn a new technique. 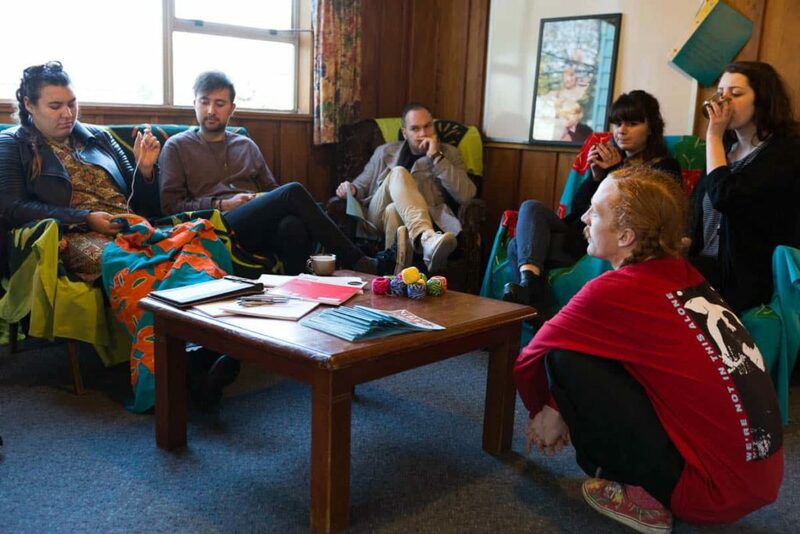 This idea of people joining in and dropping out at different points could also be seen with people flowing in and out of the different rooms in the cottage. This evoked the open, communal spaces that tīvaevae have traditionally been made in and placed the social aspects of craftwork at the fore. Although the making of single tīvaevae is a communal experience involving the efforts of many people, this exhibition highlighted the connection between mother and daughter. Nina connects herself to her personal lineage as well as a broader tradition of practitioners who have passed on their knowledge to following generations. Nina’s mother, and established writer, Stephanie wrote about her daughter’s choice to make a tīvaevae. The memory of her grandmother is evoked through the act of stitching. Conceptualising the tīvaevae in this way positions it as one of the many ways people remain connected to their ancestors and cultural traditions, and marks out a potential trajectory for future generations who may choose to directly or indirectly engage with it. With each stitch and every word, we hold time for each other, for our ancestors, and for people we are yet to encounter. Watching Nina construct her tīvaevae I saw again how learning begins from a place of knowledge. To craft something is to first turn to the immaterial—the knowledge held by others which connects us to past traditions and is later embodied by us. 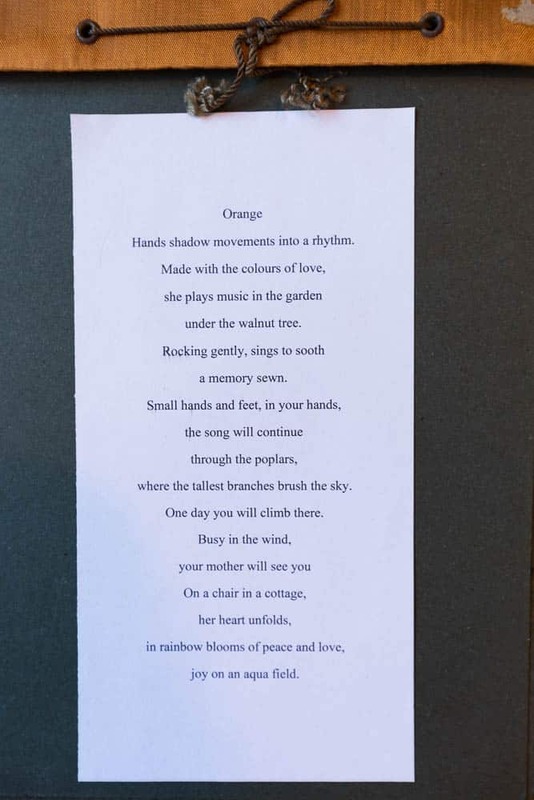 This cyclical process was articulated through Stephanie’s writing as she responded to and documented the work through poetry and prose, again contributing to the circulation of knowledge and reiterating the cultural significance of the tīvaevae within this particular context and time. On the closing night, the kitchen bench was abundant with plates of home-cooked food brought over for a shared dinner as people again gathered on the couches and chairs around the table to sit, eat, and talk. I spent most of the night deep in conversation with one of the neighbours of the cottage, speaking about the exhibition and my personal interest in crafting, and listened to stories about her own history and her experience of having lived in the Avon Loop community for many years. In between conversations, I found myself tracking and commenting on the communal hoop and needle as it swapped hands so different people could take turns and add their stitches to the fabric. Over the course of the project, the dwindling spools of embroidery thread were transformed into a series of stitches, each person’s addition recognisable, but nevertheless linked together to become a continuous marker of passed time, representative of a collective and shared memory. A performative exhibition by Nina Oberg Alaifea and Stephanie Oberg, ALPA community cottage – facilitated by Ōtautahi Korerotia, August 6th -30th, 2017. 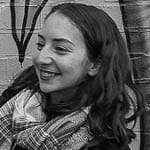 Bojana Rimbovska is a postgraduate student in Art History at the University of Canterbury Te Whare Wananga o Waitaha. Originally from Macedonia, her dual upbringing led to her interest in the different cultural approaches to craft, and the spatial elements around craftwork. 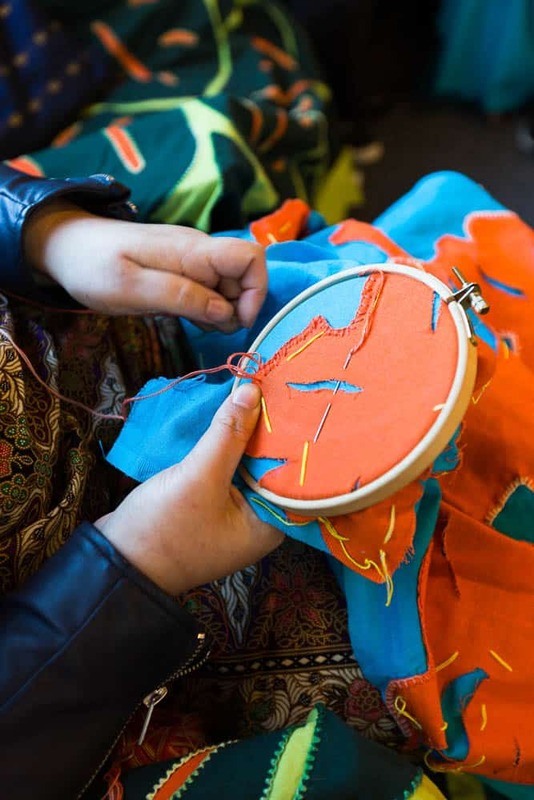 Her current research focus is on the institutionalisation of craftivism, and further allows her to explore a variety of collaborative and community-engaged artistic practices.